Online games are so useful for reviewing parts of speech! Kids get to have fun doing what they love to do while getting in that needed practice on adverbs, prepositions, and the rest. I’ve been checking out some of the many games available, and here is a selection that is easy to use and does seem to provide useful practice along with the fun. Most have choices of difficulty levels, and offer practice with at least several parts of speech. Grammar Ninja – This is a simple game in which students select the requested part of speech from each sentence, but the ninja theme and sound effects make it fun. The Beginning Ninja level asks for just nouns and verbs. The Skilled Ninja level adds articles, adjectives, and adverbs, and the Master Ninja level also adds conjunctions and pronouns. Grammar Blast –These are games from Houghton Mifflin in levels for 2nd through 5th grades. Each game is a simple multiple choice quiz in which students score 10 points for getting the answer right on the first try and 5 points for a correct answer on their second try. 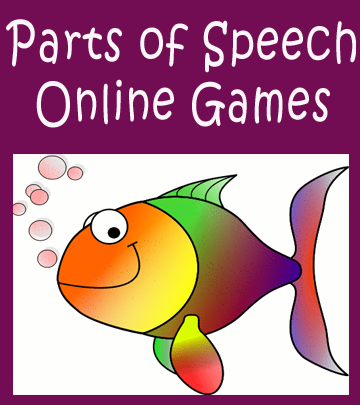 The parts of speech games include nouns, verbs, pronouns, adjectives, and adverbs. Grammar Practice Park – Each of these little games from Harcourt is different and provides practice with one part of speech – nouns, verbs, pronouns, or prepositions. Life on a Pronoun Reef is one example; in this game students choose the correct pronoun to fill in a sentence as they tour through a cartoon-style coral reef. The difficulty of the games ranges from grade levels three through five. Parts of Speech Asteroids – To begin this game from ABCYa, students choose the part of speech that they want to work on; the choices are noun, verb, pronoun, adjective, adverb, or preposition. The object of the game is to shoot down asteroids labeled with the correct part of speech before it crashed into the planet. 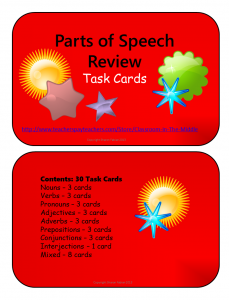 For more practice, you might also like these Parts of Speech Task Cards from my Teachers Pay Teachers store.